I am a huge fan of living social/groupon type deals. I often buy too many at one time, and then realize that at least one of them is getting close to expiring. I bought the Roessler’s deal a while back when my honey and I were still trying to find a venue for our wedding. I had heard that Roessler’s was a really pretty setting and worth checking out, and then a few days later, I saw a $40 for $20 offered online and scooped it up. I figured it would be a perfect way to check out the setting and the food at a fair price. Roessler’s is known for being on the pricey side, so a Living Social opportunity made it a lot more doable for us. We made our reservation for the exact day the coupon was going to expire because we literally could not find any other day that would work being the busy X-mas/New Year’s season. We arrived to find a really lovely restaurant in an unexpected place- along South Tamiami Trail among Target, Walmart etc. It was sort of off of the main street in the back, where you’d really never expect to find a pretty restaurant hiding. We were led into a large dining room and seated by a window with a view of a garden. If we weren’t already totally thrilled with the beach front wedding venue we’d chosen, I could totally see having it here. Our waiter was a bit on the schmaltzy/theatrical/cocky side, but more or less entertaining none-the-less, and definitely efficient at his job. He brought us menus and water, and went over the specials for us. After seeing that the entrees were in the $30-$40 range, we decided on sharing a bunch of appetizers instead, and with a list of many appealing ones, the choice wasn’t easy. 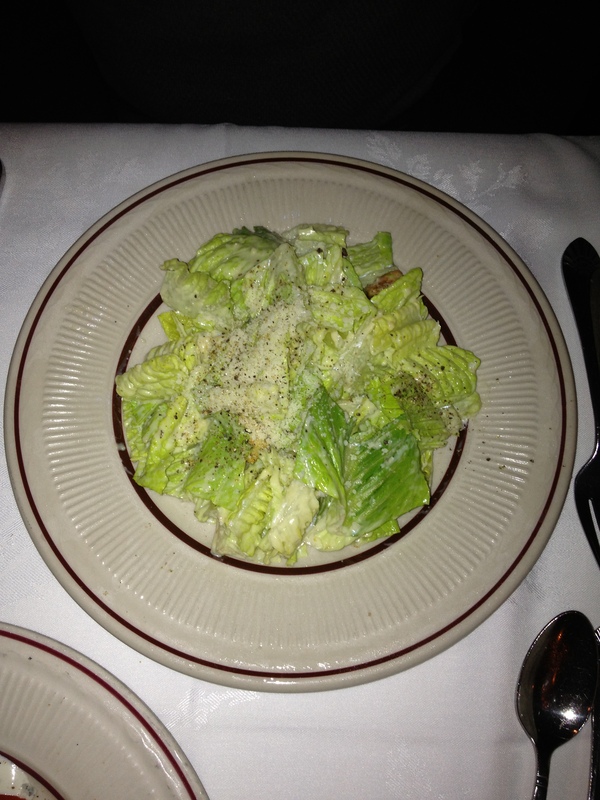 We settled on 2 salads; an excellent caesar and an iceberg wedge- which was described to us as having smokehouse bacon, fresh tomatoes and a buttermilk blue cheese dressing. When it came out, smothered in way too much dressing, and having one, lonely, halved, grape tomato, we were a bit disappointed. 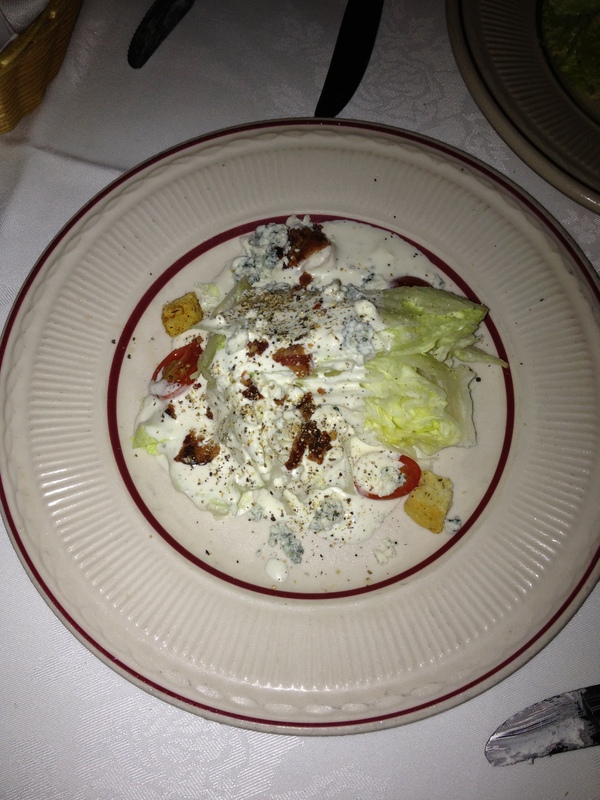 The dressing was really outstanding with it’s chunks of aged blue cheese- even though it was pretty much drowning the lettuce, but the one skimpy tomato, two sad croutons and tiny bit of crumbled bacon was sort of a let down. Next we thoroughly enjoyed the smoked salmon appetizer. It was served with toast, cream cheese, capers, red onions and sliced hard boiled egg. The quality of the fish was clearly very fine, and we polished this plate off quickly. 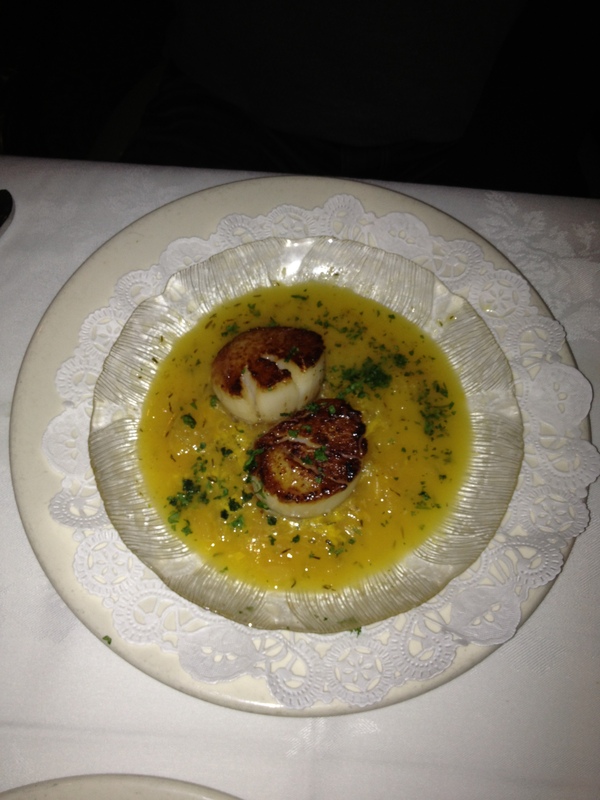 The scallops in citrus sauce were probably my favorite dish. Huge scallops, cooked perfectly without a hint of chewiness. The sauce was buttery and fragrant and I admit to using bread to sop up some of what was left behind. 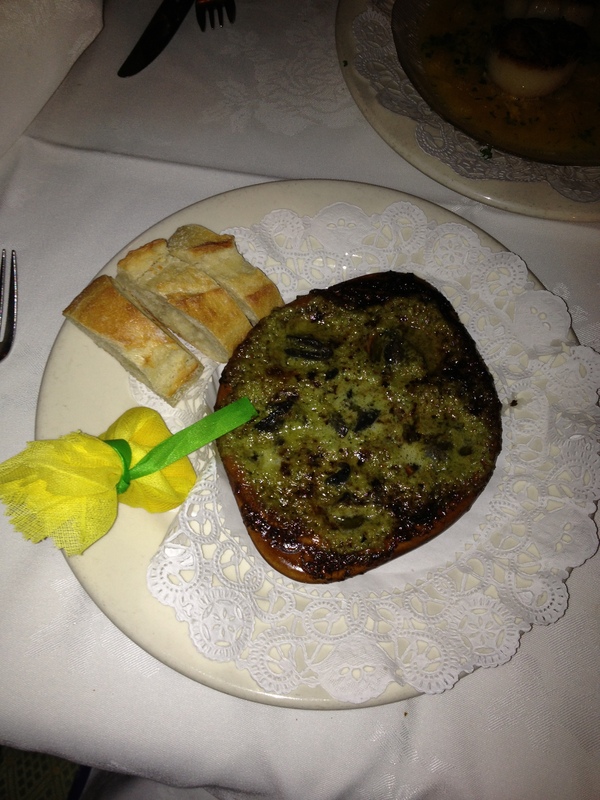 The escargot were prepared in the classic French manner and were good, but not particularly exciting in their garlic herb butter. Again, however, the sauce made me want to ask for a refill on our bread basket, which I did. For dessert, we decided on the chocolate mousse. Admittedly, it wasn’t the most daring or creative sounding option, but we saw a few go to the next table and it just looked so darn good. It arrived quickly and totally met our expectations. Rich and chocolatey and as light and airy as a heavy cream based dessert can possibly be. The atmosphere (mainly the outdoor atmosphere) is definitely the highlight at Roessler’s, even though the food is surely very good. It would probably thrill a ton of people, but my tastes tend to sway more toward very creative, original foods instead of the classics. The crowd here is definitely older and a bit stodgy, making this an ideal restaurant to take your grandparents for a fancy occasion. As far as coming back as a couple, I would doubt it.